Home › Rock Music › Remember The First Time You Heard….Bowie’s A Space Oddity? Remember The First Time You Heard….Bowie’s A Space Oddity? Whilst David Bowie hibernates in the winter of his fine and distinguished career “nursing his enigma” as Gary Kemp put it, there is no shortage of people trying to coax him out of retirement. Bowie appears to be a rare case of a rock n roller actually retiring (not that he’s announced any such thing – but if you haven’t played a show for eight years you scarcely need to do you?). More often it’s the record company that makes the decision to try to “retire” an artist – as X-Factor winner Matt Cardle amongst many others will testify. No chance of that with David Bowie. Mind you, who can blame him? If someone had thrown (and lodged) a Norwegian lollipop in my eye the last time I went to work, I’d be taking a pretty hard look through the HR manual to see when the pension scheme kicked in. After I’d eaten the lollipop. Can’t let a good Chupa Chup go to waste. Although I first heard David Bowie (and, for that matter, Stevie Ray Vaughan) on Let’s Dance, I wasn’t then aware of his amazing back catalogue. The first time I heard Ashes to Ashes was when Rik sang it on The Young Ones. 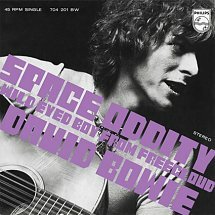 I first heard A Space Oddity during a school Drama lesson when I and a clutch of my thirteen year old classmates were asked to act out a scene to the soundtrack of the song. I think my teacher was a big Bowie fan. I’m sure you can picture the scene that would have made Gielgud turn in his grave…. The trickiest bit was pretending to walk in zero gravity for five minutes. We ballooned around a bit and then I forgot halfway through. When asked why I had sped up my walking in space at the end of the frankly shambolic routine I bluffed that the ship had anti-gravity capability. No-one was impressed. A Space Oddity is such a stunning song of course. I could have been doing anything and I would have remembered what I was doing when I first heard it. Just like the first time I heard Maria Carey’s version of Journey’s Open Arms (the brick is still lodged in the TV screen to remind me). A Space Oddity was released in June 1969 at the time of the moon-landings and reached #5 in the UK charts. It took until 1973 before it became Bowie’s first top twenty hit in America and until 1975 before a re-release gave Bowie his first Number One hit single in the UK. Shatner is one of a kind… Thank goodness. I think it was the 75 release when I really appreciated Space Oddity, though I’d been into Bowie from the release of Ziggy Stardust. His music is truly some of the best of all time. Timeless sounds. i did this top ten a while back. I could do it again and probably pick a lot of different songs, there are so many great ones. Nice list – and such an impossible task to just have ten Bowie songs as you say. No Laughing Gnome though? It was such a hard call to leave out Laughing Gnome!